"I like your salesperson James Snyder. Your pricing is high but quality of work is there for the price. You should look at giving..."
By Mary And Bud H.
"As a person who doesn't like to hire out many jobs, I'm really glad I chose Ayers on this one. Dillon and the crew were amazing..."
Your home should be comfortable, safe, and dry for you and your family and James wants to help make and keep it that way. 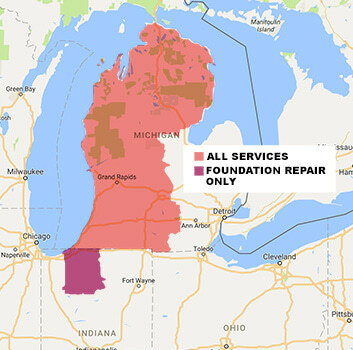 James completed extensive training to design solutions for your waterproofing, foundation, and crawl space repair needs. This includes earning the Certified Waterproofing Professional designation through the Basement Systems International Network of Waterproofing Contractors. Bringing a comprehensive, personalized approach to every job, James will give you a custom solution based on your goals and exactly what’s going on in your home. His customers regularly recommend him and the Ayers Team to their family and friends. James has worked as a district sales manager where he trained others on the importance of service and meeting customer needs. These experiences have prepared him well to address your home’s issues. “I love the opportunity to help people in some of their most trying times in home ownership,” said James about his meetings with customers. “That moment when we come up with a reliable solution to their problem and the worry just starts to fade makes it all worth it.” Ensuring that homeowners get a quality inspection and sound advice and also feel comfortable and cared for throughout the entire process is truly his goal. Originally from the thumb of Michigan, James currently resides in Grand Rapids, Michigan with his wife. He also has two sons that he loves spending time with. In his free time, James enjoys being outdoors, especially when he has the opportunity to golf. James is looking forward to meeting you. Our wonderful client Helen from Grand Rapids, MI had water entering into her crawl space with each rain storm she endured. Living in her dream home was slowly turning into a nightmare. Helen’s worry about mold growth became an eye opener to our friend that she needed to address her neglected crawl space. Helen’s trusted friend’s Sarah & Dan told her that they knew just the right contractor to help guide her, Ayers Basement Systems. That day we received our new friend’s call for help, and the journey to a dry crawl space began. Upon examination of the issues at hand, our professionals sat down with Helen and addressed our concerns. One key concern was the lack of a sump pump. Together Helen and our team devised a dry crawl space solution consisting of our CleanSpace encapsulation system and a Smart Sump pump. The CleanSpace is made with anti-microbial properties that prevent mold growth, so Helen could be sure mold will not form on the encapsulation system. After the first few storms with her new system, Helen went down to see if the system had solved her problems. After seeing not a single drop of water had entered her crawl space, she went back up the stairs with a smile on her face. Like Helen, you don’t have to face your crawl space issues alone. Call us for a free estimate today. Kerri from Rockford, MI was struggling with a constantly wet crawl space. Living near the lake, a high-water table was causing water to come up through the floor. Kerri met one of our System Design Specialists at a local trade show and quickly became our friend. Upon scheduling a free inspection and inviting us to her home, Kerri worked with our experts to devise a solution that met her budget and solved her wet crawl space problems. Through the use of CleanSpace Drainage Matting and the CleanSpace encapsulation system this was achieved. Thanks to the collaborative efforts of Kerri and our team, living near a lake is no longer a sweat for our friend. Call us today, to schedule your free estimate. Does your home have a crawlspace? And does that crawlspace seem safe? Well this Lakeview home had a very unsafe crawlspace, so the homeowner gave us a call. We came to their home and fully insulated their crawlspace from the outside environment. CleanSpace is the ultimate insulating technology. CleanSpace is a 20 mil thick plastic liner that fits to the crawl space to completely seal the home from the earth. Polyester cord reinforcement allows for a lot of durability, to make it last longer than the home will. This liner also contains an antimicrobial additive to prevent mold. Now this homeowner's crawlspace is so much safer and will improve his health and his energy bill. We received a call from these South Haven MI, residents saying that they were having flooding issues in their basement pretty frequently. After going out for our free inspection and assessing their situation, we decided the best course of action was to install our WaterGuard Below Floor Drain. Our WaterGuard is an interior waterproofing system that is more efficient and lasts much longer than other perimeter systems. Unlike other systems where it is placed alongside of the footing, WaterGuard is placed on top of the footing. This is important because now since it’s on top, mud will not get in the drain and clog it simply because the drain is not sitting in the mud. The WaterGuard system collects water that seeps through basement walls and drains it to your sump pump. The system installs quickly and has a clean finished appearance, meaning you don't have to worry about having an unsightly drain around the basement.